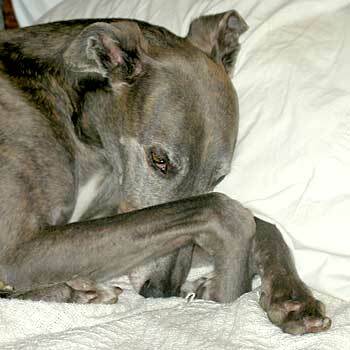 Xander, was the most beautiful, gentle soul I have ever known, with a look like no other greyhound - he was beautiful, inside and out. He was an owner release, and the day I went to pick him up to foster, I could not believe my eyes. I have always told everyone that commented on his beauty that he could have been purple, and we still would have had a bond like no other. I took one look into his eyes that day and I knew that I was going to fail fostering!! I didn't let anyone else know what I was feeling, but in my heart, I knew he wasn't going anywhere. 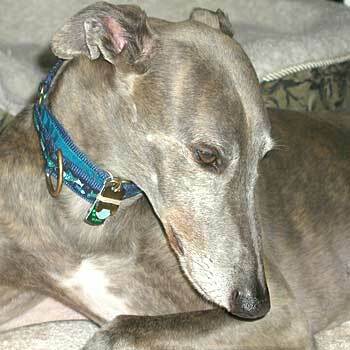 Xander showed me what a gentle, quiet and intelligent soul he was. 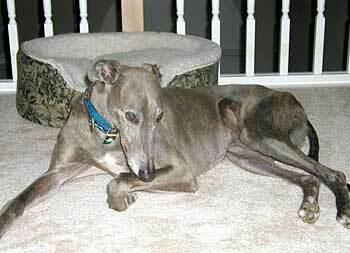 He was the kind of greyhound that was regal and stoic, not silly and playful. 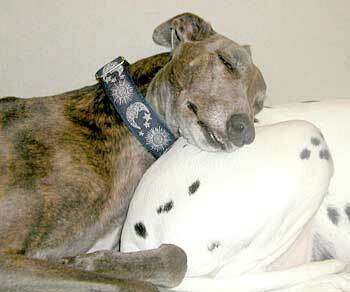 He was loyal and undemanding - my friend and my companion. His sudden departure from this world will always be a mystery to me, but I have been blessed to have had him in my life for 2½ years. I know that he is happy and healthy and no longer afraid of thunderstorms. There is a huge hole in my heart. I will miss you forever, Xander.